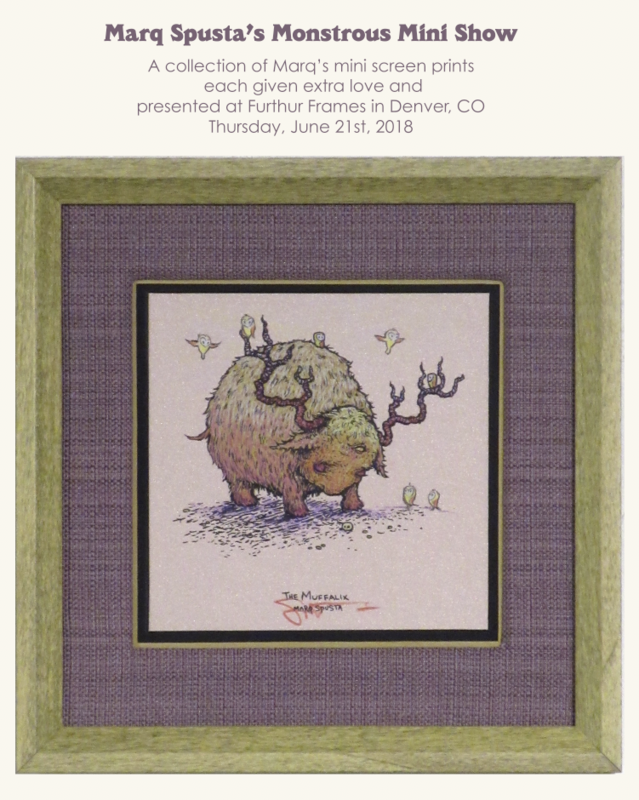 This show will focus on framed mini screen prints, each uniquely embellished by Marq. There will be some mini print packs available at the show, though not many full size prints or posters. Marq will be on hand to doodle up little things for collectors. Stay tuned for more details (like time of opening). Please comment if you plan on coming, we’re trying to gauge numbers a bit. I wouldn’t miss this for the world! So very excited! I will be there with bells on sir… can’t wait to meet up in person. Yes, I will be there. Can’t wait! My first Spusta show, cannot wait!! Panic and Spusta, 2 of my favorite things rolled into one amazing trip! I will be there! Cant wait to finally get the chance to meet a bunch of the great people I’ve talked to over the last couple years! My favorite weekend of the year just got better!! Definitely will be there! Bringing a crew and we’re camping in line for a week to make sure we get the goodies. Can’t wait!$! Dibs on that Muffalix! Would love to see more preview pics! Oh Hell YEa. What a great way to start a vacation!! Marq and WSP for the win!! Favorite Artist, favorite frame shop, and favorite band. Stoked to say the least!!! I will be arriving in Denver that day! Going to be flip-tastic! I’m going to bring a bunch rare prints to sell as well so no one will be left out of the fun. I love cashing in and catching up with other fans. Maybe I should do a line raffle for those waiting multiple days… powerball or winner of Rockies game maybe. I’ll be there plus my ol’ ball and chain! I have some very rare pieces for sale for locale pick up only in Denver, so if you miss out on something nice at the show just message me and come take a look. I’ll be there, this sounds fun! Will be there, and while I love Santa Fe, I will most definitely not be camping out over night. Would love to walk home with that ‘Progressing’! See ya at the show! Can’t wait! Coming back from mountains on 21st, but i will be there. I’ll be there with bells on! Any details on the time??? ?